Been a nice week. Book was released (pretty! ), there were (briefly) gumdrops in the cupboard, and I got a chance to even begin my taxes. How luxurious! 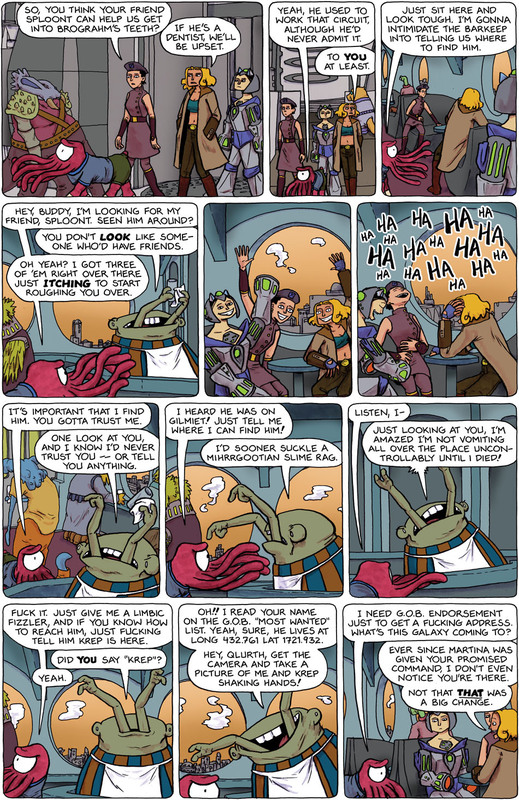 I should mention here that “Spacetrawler book 1 — The Human Seat” is NOT ONLY FOR SALE, but is also ripe to be nominated for the Hugos in the category of “Best Graphic Story.” So, if you wish to nominate it (you must already be a member Renovation, nominations due March 26th), you have my support (and encouragement). Oh, and if you want to express your pleasure with Spacetrawler on Goodreads, Matt has created a page for it there. Ooh! Ooh! 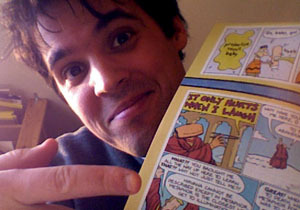 The baring of much teeth in panel 5! Grasping pods extended to whip down! Aggressive gestures in extreme! Obvious creatures not good to eat. Dang, I wanted to see Dustin get hoofed almost to death and pissed on. Does Yuri still have hands (or anything else that fulfills that function) in there somewhere? I keep wondering how to feel about her. She’s had the most traumatic experiences (torture, mutilation), but on the other hand she seems to roll with it and actually preffers/enjoys the mods made possible by said trauma. On the third hand that could just as easily be a coping thing, like she’s bunkering herself up inside. And the upgrades keep stacking up too, haha! Eventually she’ll be a giant transforming space gunship-robot… with wee cat ears on top! Yeah, I knew her human arms and legs were all gone, I was just wondering if her current set of mecha arms have retractable manipulators or force fields or something that can be used to grab and pick stuff up like hands. I saw her sitting at that diner booth, and suddenly had a hilarious mental image of her trying to eat a hamburger by blasting the tabletop and hoping some of the bits get thrown in the direction of her mouth. @Justme: Pierrot is still technically a part of the crew, in absentia. For some reason, this strip reminded me of Spongebob Squarepants trying to get into the tough bars of Bikini Bottom. I like Emily’s new coat better than the old one I think. I like those lower arm accents. Sorry double posting, but also @justme don’t forget Gurf. Got my book in on Saturday and spent the rest of the afternoon reading it. Now anxiously awaiting book 2! sigh. Yeah, Krep talks a lot of smack, but he doesn’t actually do much except talk and complain. I adore panel 5! It shows the camaraderie developed between the crew. Perhaps Yuri has some other “go go gadget” appendages/tools in panels to assist when opposable thumbs are needed. Martina has obviously embraced her role as captain and as an intergalactic revolutionary. Love the Che Guevara action she’s got going on there. Yuri’s living her manga and anime dream come true. She’s not just a cyborg with alien cat ears, but a grafted brain of the smartest species in the universe—Eeb’s. Nice to see the gang top heavy with female power. Usually there are one or none. Go team….not sure what to call them yet. Those latitude and longitude figures are a bit on the high side – are they supposed to go flying around the planet a couple times to get there? Now I’m imagining planets with unusual space-time geometries where that would be a sensible notion.